Click on the image to visit other great quilts! I'm not 100% sure on the rules for the quilt festival but I assume Park City Girl wants a showcase of a finished quilts! I made this quilt for the Spring 2009 Flickr Doll Quilt Swap. It measures 19" square. 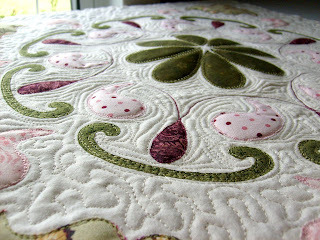 I used raw edge applique for this little quilt. All of the quilting and applique was done free motion. It was kind of scary at first, but I love the finished result! I wasn't too crazy about the binding I chose but my swap partner was thrilled with the quilt, so I guess it was a success! That quilt is beyond lovely! I can see why your swap partner was thrilled! Very nice! I think I saw this quilt in the magazine and I believe it was on one of the Fons and Porter TV shows as well. Lovely colour choices! Your quilt very pretty and elegant. Thanks for sharing. simplemente hermoso! thanks for sharing! Wow! I'm impressed. That is very beautiful! You've got serious skills! Gorgeous and so delicate looking. What an exquisite quilt! Do you have any tips of free motion applique - interested to know if/how you fused/fixed the pieces in place before sewing them? I'd have been thrille to receive such a beautifully made quilt too! 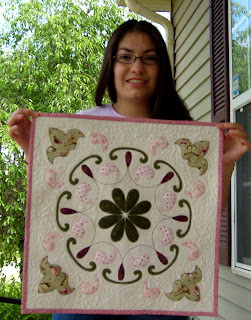 Congratulations on a stunner of a little quilt. Thanks for sharing your quilt's story. 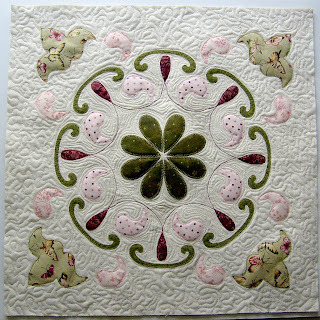 Lovely quilt, and the quilting is exceptional! What a lucky person to get that in an exchange. It's very beautiful. Thanks for showing it. Your Swap partner was so lucky. It is such a beautiful doll quilt. Wow, I thought this was going to be a huge quilt in the first picture. It's wonderfully executed! Those little tiny bits must have been difficult to work with. absolutely stunning! The quilting is amazing. You are so talented! I love this quilt! Such a unique design and the colors are so well placed! This is such a beautiful little quilt. Great work. wow, this is amazing! Such talent! Oh my goodness, this is an incredible quilt. Beautifully done! Your quilt is absolutely stunning. You did an amazing job! ParisMaddy took my words...absolutely stunning! It takes my breath away. Beautiful! You did an awesome job on the quilting.